Director McG, star Christian Bale almost declined "Terminator Salvation"
LOS ANGELES, California (CNN) -- "Terminator Salvation" is a sequel that almost had a different cast. 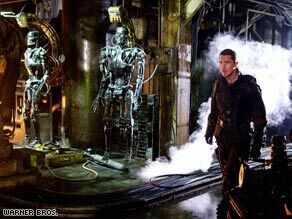 Christian Bale walks into trouble in "Terminator Salvation," which opens Thursday. "I didn't want to take this on. I thought a fourth movie ... who needs it? The story's already been told and I'm not really interested in doing that," said director McG. "Then I heard that the story was about the future man versus machine and that sort of piqued my interest." McG (born Joseph McGinty Nichol, though known by his nickname since childhood) said if he was going to take on another sequel in the internationally successful "Terminator" franchise, then he had better have a good reason to do it. "Action for action's sake just becomes noisy. You've got to have great characters. You've got to have a great story," he said. "We wanted it to be very compelling and we did it in a way that is great." McG wasn't the only person associated with the "T4" saga who was reluctant to sign on initially. Christian Bale, who plays John Connor, was similarly dismissive. "The whole idea of a 'Terminator' movie was sent to me and I said no," said Bale. With that response, McG said he had to really step up his game to persuade the "Dark Knight" star to sign on. He visited Bale on the set of the Batman movie and sold the story to him. Bale, who had been initially targeted to play Marcus Wright -- a resistance soldier with intriguing memories -- ended up taking on the character of John Connor thanks to a reworking of the script, he said. "We got a really good writer on board that just had free rein to write whatever we wanted," said Bale. "The Connor character got expanded. I got interested in that character." Once Bale got on board -- he was the first cast member to sign on -- "Terminator Salvation" became a reality. The film takes place in 2018, after the apocalypse brought on by Skynet, the computer-controlled defense system that becomes sentient and launches a nuclear war. The last human beings on Earth are fighting with the Terminators, overseen by Skynet. John Connor is the take-no-prisoners leader of what's known as the human resistance. For the role, Bale -- an actor known for immersion in his roles -- went all out. "The skill I had to acquire was weapons handling and understand[ing] the weapons. Getting that all down [was] very important to me," said Bale. The other cast members said they got in prime physical shape for their roles as well. Moon Bloodgood, Australian native Sam Worthington, Anton Yelchin, rapper Common and Bryce Dallas Howard are Bale's co-stars. Howard said she had just had a baby when she was offered the role of Connor's wife, who is pregnant in the film. She says she didn't need arm twisting to join the cast, because she had been a fan of the franchise for quite some time. "For me to be in 'Terminator' is just so bizarre. It's incredible, because it had such a profound impact on me when I was younger," said Howard, 28. "It was one of the first movies I first saw that blew my mind." It's that kind of awe that has kept the "Terminator" series alive and spun off video games and TV shows. Now the cast hopes their core fan base will make the fourth flick a blockbuster. "It's a summer action movie," said Bale. "We wanted to make it the best action movie for this summer."